The interaction between journalist and talent is always an interesting one; a delicate dance, each giving a little in a bid to get a lot. It’s on purpose I tell her this anecdote, not to manipulate but to incite a feeling of a safe space for the self-described “introverted” singer. To incite a feeling that I relate to her music. Because, well, it seems everybody can. So universal are her lyrics – and ethereal and haunting her sound – that Wafia has heavyweights Pharrell Williams and Jaden Smith playing her pop ballard Heartburn, (written with Melbourne musician Ben Abraham), on their Beats 1 radio shows. Kylie Jenner is also a super fan regularly Snapchatting to the echoes of “Well I guess what hurt me most of all/ You were playing with my heart”. “My music has reached the ear of a causal listener that it hadn’t reached before and my socials went up. [Kylie’s] audience are really into what I’m doing and they’re not just listening to my music for the sake of pop music, they actually care about the messages in my songs and have taken the time to listen to the rest of my EP which I think speaks volumes. I was really lucky to be given that platform and am really thankful,” says the singer. Growing up in Brisbane and the daughter of a Dutch restaurant owner, Wafia (real name Wafia Al-Rikabi) began singing in churches alongside a piano. “My parents were quite nomadic – I went to 13 different primary schools – and I would always join choirs wherever I was,” says Wafia. “But I never actively sort out to write music.” It wasn’t until her second year of university where she studied biomedicine that Wafia began growing tired of the monotony of exams and assignments and found songwriting. With a guitar in hand and clad in world views that had been derived from her itinerant lifestyle, a seismic shift in her life ambition occurred. 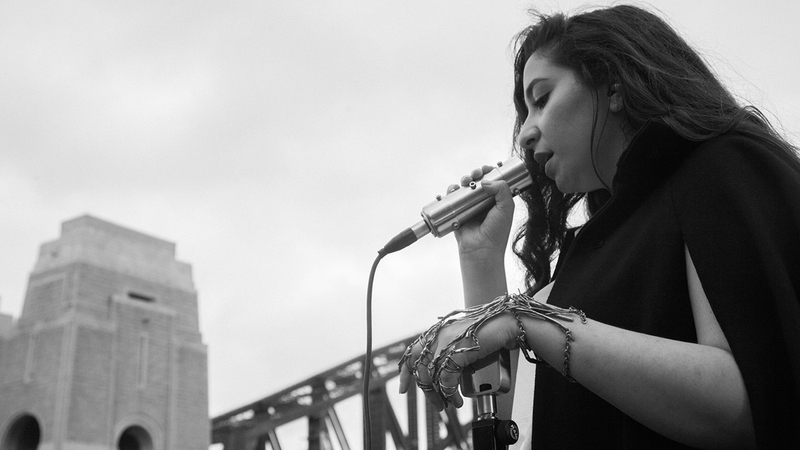 Heartburn, released in October last year, is the first single from Wafia’s EP XXIX and follows an initial introduction to the star back in December 2012 when she covered Mario’s Let Me Love You – a cover that was instantly talked about within inner music circles in Australia and the world. (See Wafia’s recent performance for GRAZIA of this track here). Then came the collaboration with Japanese Wallpaper; a track that featured on Zach Braff’s 2014 kickstarter film Wish I Was Here. Teaming up with good friend and producer Ta-Ku in 2015, Wafia performed at MoMA PS1 in New York City to high appraise. In March 2016, she released the incredible single Window Seat which she wrote in one day with Kiwi up-and-comer Thomston. “It’s easier to digest than say, visual arts. You don’t look at visual arts and hear the work. I also love that you can explain your emotions through music in ways you probably couldn’t in a conversation,” she explains. And just like that; five-foot-two and a wild and eclectic clash of contradictions you just can’t help but marvel. One thing I do notice on set today is this special young lady really is as introverted as she says yet has so much to say. She’s unsure of her angles but sure of her vision. Unsure of her feelings but sure of her conviction in her lyrics. Unsure of her dance moves but sure of her performance. “Ooh be careful”, the singer says as I help her place her custom-made copper hand jewellery – a gift from a friend – vigilantly on her hand. “Do you know why it’s copper?” Wafia asks me. “Tell me,” I reply. “Copper is always in a state of change,” she says. “My EP name XXIX is the Roman numeral for 29 which is the atomic number for Copper. The metal always adapts to the situation it’s placed.” Perhaps an insight into her own self. Be certain: You are witnessing something truly special; a Furstenbrug before the wrap dress, a Kendall before Marc, a Yoko before John. Piling suitcases of instruments into our tiny Uber on our way to our next shoot location, Wafia, in signature black with white sneakers, is hurriedly messaging friend Ta-Ku. Sitting seatbelt-less on top of keyboard cases, and intermittently bobbing my head every time a police car threatens our perimeters, I wondered if the guy who Wafia wrote Heartburn about ever found out it. He did.